I love the book Snow almost as much as I love actual snow. I love when it snows. 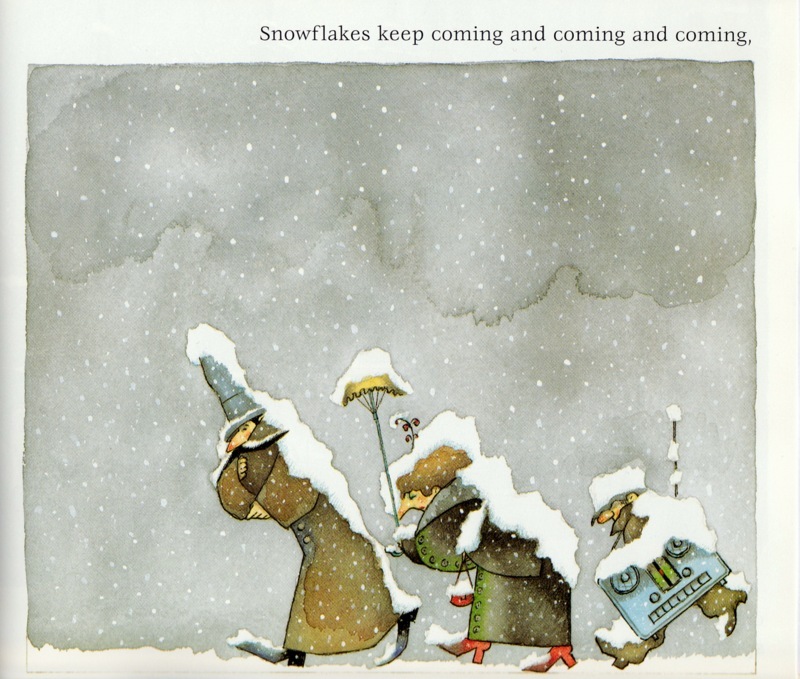 Truthfully, I cannot recall a single time in my life where I was not euphoric at the mere prospect of falling snow. I grew up in Syracuse, New York where the annual snowfall is the highest in the country, so that’s a lot of excitement. I’m telling you this because the enthusiasm I feel about the book Snow is almost as strong as my love for actual snow. Uri Shulevitz published his first book in 1963. In 1969 he won the Caldecott Award for The Fool of the World and the Flying Ship and has published multiple books since. Born in Warsaw, Poland, and raised in Paris and Israel, an old world feel seems to seep into all his work. Comprised of tall, narrow, attached buildings facing an open square, the town featured in Snow is no exception. Shulvitz’s watercolor illustrations superbly capture the murky atmosphere of the coming precipitation; the dampness of the air is almost palpable. Falling flakes of snow appear as delicate pinpoints of white in the dark sky. In the opening spread, the art covers only a portion of one page and shows the gray sky over the gray city. As the book progresses the art expands, until it finally covers an entire two-page spread. 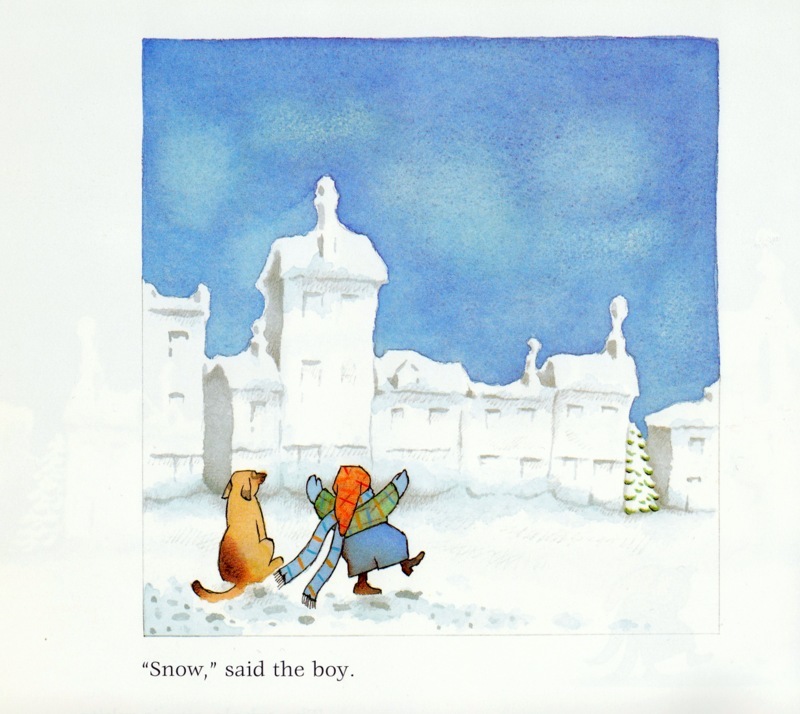 The short, poetic text in this perfect story follows a small boy and his dog as snow begins to fall on the city. Snow has not been predicted, but the snow cares not for predictions; it cares only about falling. One snowflake becomes three and, though they soon melt, there’s many more to follow. 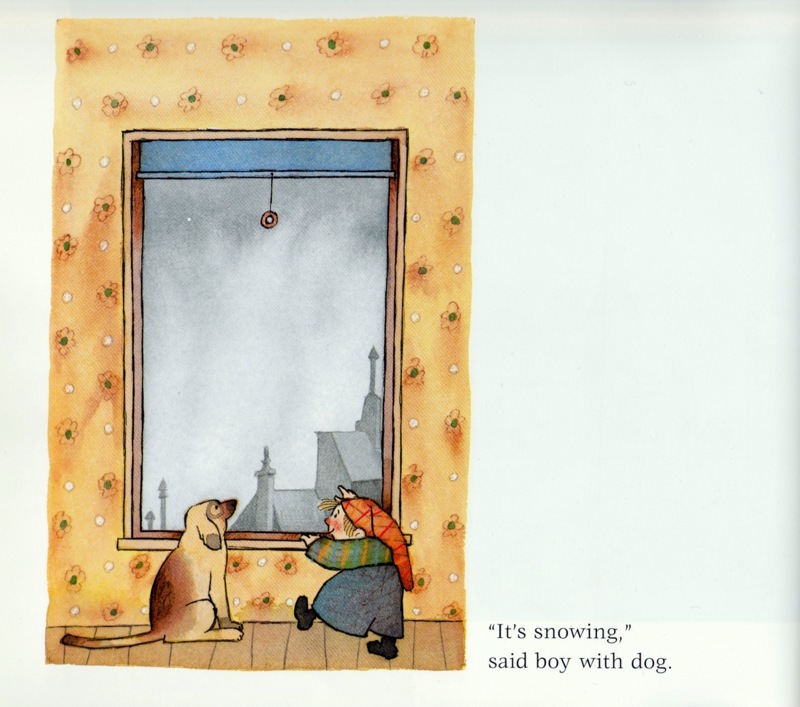 The boy and his dog head outside to enjoy the wondrous weather event but the townspeople, ignoring the flakes in front of them, dismiss the boy’s declarations of snow. Before long, the snow is accumulating and the townspeople head to their homes for refuge. Only the boy and his dog remain in the street, celebrating the glorious event. Some familiar characters from children’s stories—floating from the front of one of the town’s bookstores—join the jubilant pair. The merrymakers dance and twirl in the snow as the whole city is blanketed in white. This is, hands down, one of my favorite picture books. My daughter is nine. I’ve given this book as a present ever since it was gifted to her when she was born. 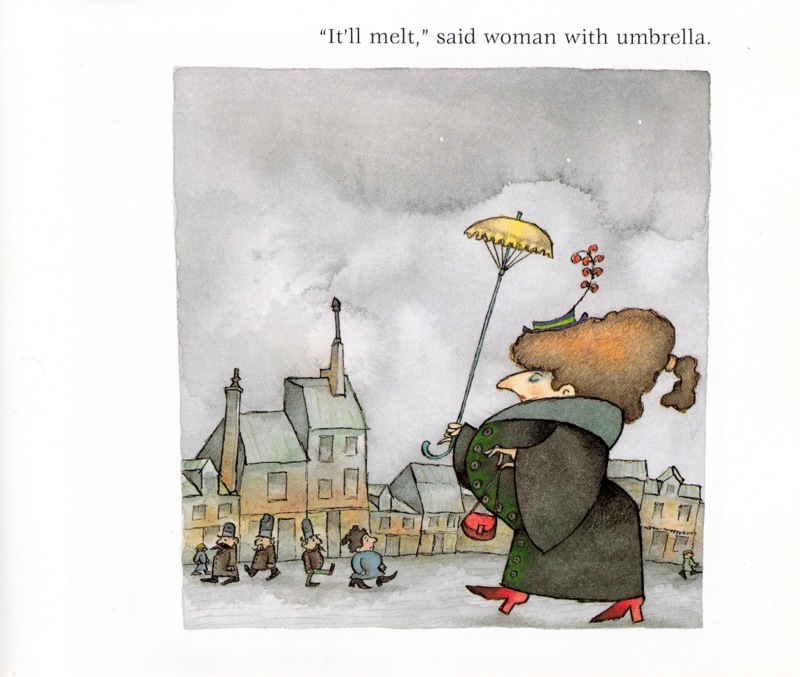 The illustrations are gorgeous, the text is spare and lyrical, and the theme is to the point. LOVE. I stumbled upon this book last winter and enjoyed many readings with my two-year old. You’ve reminded me to get my own copy before this year’s first snowfall. Love these older books. A good book is never out dated. Growing up in India, Russian childrens’ books were what was easily available. I LOVED the illustrations, and kept the whole lot for my kids too. We have a tattered, scribbled upon, bunch of books in some dark cupboard somewhere, because I could never bear to part with them. I cannot wait to read this. It has all of the elements of a perfect children’s book to me…Thank you so much for the introduction! Thanks for this – I was looking for the perfect book for my nieces and nephews (ages 3-5) and this is perfect!